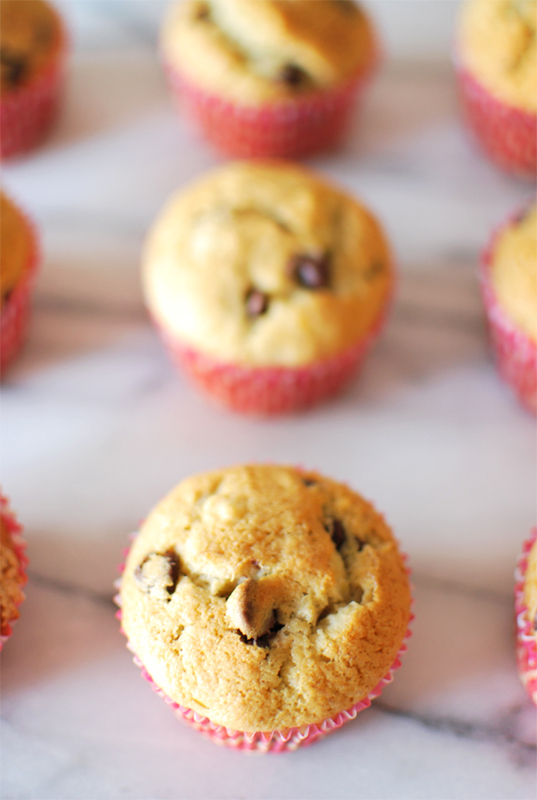 As promised, here is a recipe for the yummiest, easiest chocolate chip banana muffins you'll ever make! Bananas are something that we always have in our house. It's a staple because we always include a banana in our daily fruit smoothies. But recently, I kind of went overboard in buying too many bananas and had an abundance of ripe-about-to-go-bad bananas. We usually freeze them for the smoothies when that happens, but I was really hankering for some kind of banana bread or a variation of it. Then I remembered we had a half bag of semi-sweet chocolate chips from a previous recipe that I tried out (total Pinterest fail which is why I haven't shared anything about it - still need to perfect that one before sharing). So I decided that chocolate chip banana bread was going to happen. 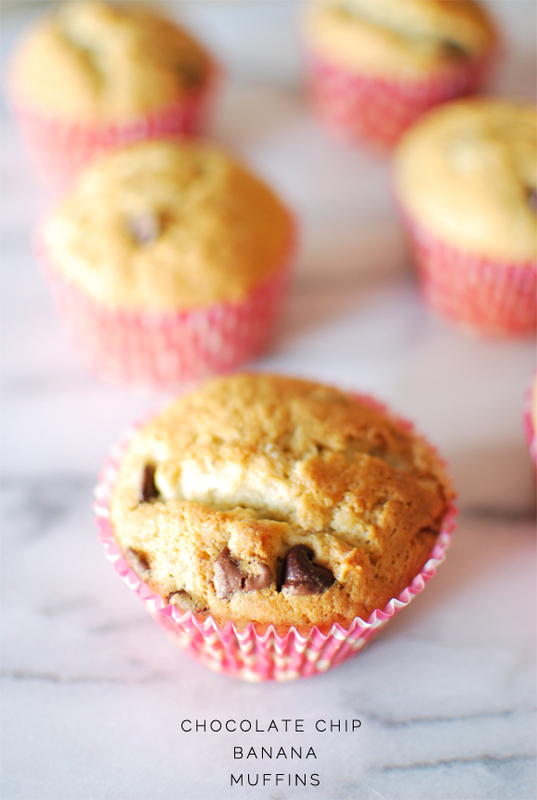 But then I thought it would be easier to eat (for on-the-go purposes) if they were in the form of muffins and so voila! That's what I made and they are absolutely delicious. I used this recipe but tweaked it a little with the addition of vanilla extract (makes everything taste better, right?) and baking them in cupcake pans instead of a loaf pan. - Preheat the oven at 350 degrees. - Sift together flour, baking soda, baking powder, and salt. - In a large bowl, cream sugar and butter. - Beat the egg slightly and mix into the creamed sugar & butter mixture along with the mashed bananas. - Add the vanilla extract. - Mix in sifted ingredients until just combined. Stir in the milk and chocolate chips. 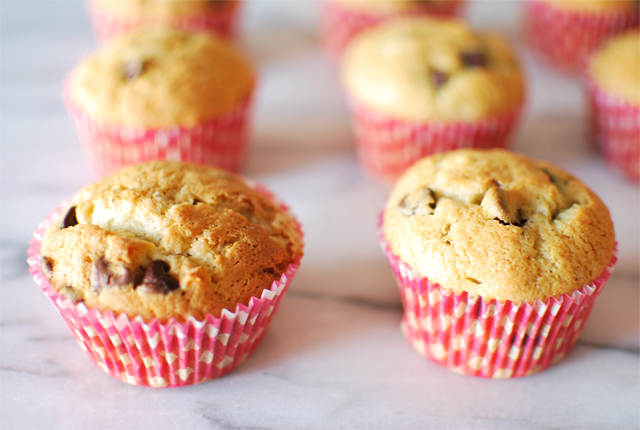 - Fill a greased cupcake pan with the batter. 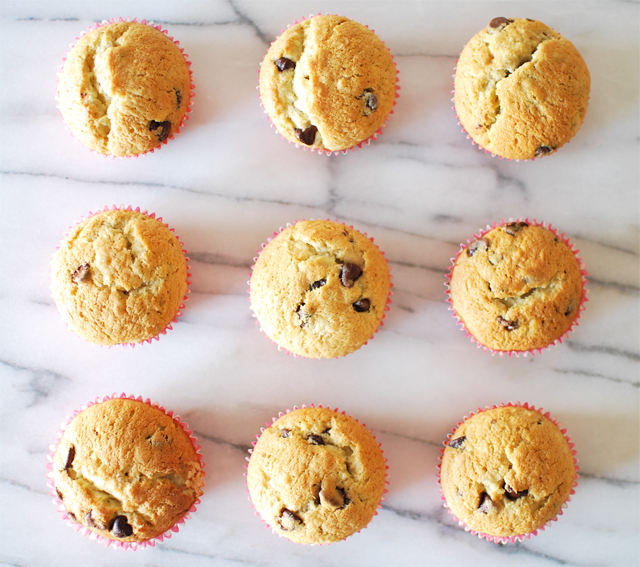 I used an ice cream scoop to fill them so that the muffins would all be the same size. I also used cupcake liners since I had these perfectly Spring-y pink gingham ones. - Bake for 28 minutes or until toothpick comes out clean with no batter and the tops are a light golden brown.